An important part of preflight planning is determining that the aircraft is loaded so its weight and CG location are within the allowable limits. The methods of accomplishing this are the manual computational method using weights, arms, and moments; the chart method using weight and moment indexes [Figure 5-2]; and the loading graph method, which eliminates the need for some mathematical calculations. Figure 5-2. Airplane loading diagram. The manual computational method uses weights, arms, and moments. It relates the total weight and CG location to a CG limits chart similar to those included in the Type Certificate Data Sheet (TCDS) and the Pilot’s Operating Handbook/Aircraft Flight Manual (POH/AFM). A worksheet, such as the one shown in Figure 5-3, provides a means to record and compute pertinent weights, arms, and moments for all onboard fuel, personnel, equipment, cargo, and baggage that is not included in the aircraft’s basic empty weight (BEW). 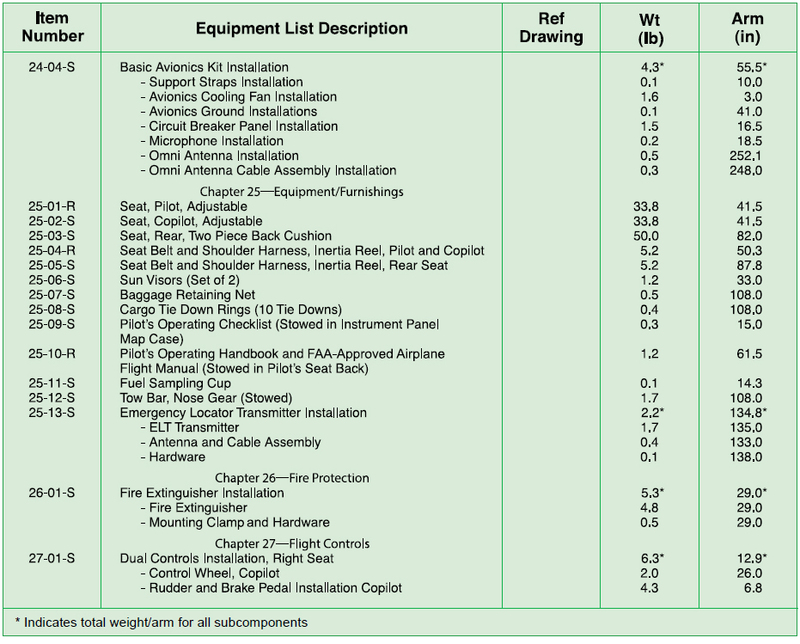 Figure 5-4 is a sample of a typical equipment list where many of the pertinent weights and moment values can be found. 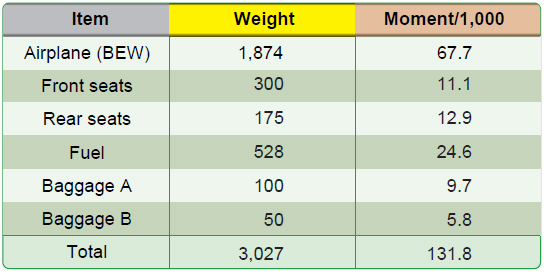 As part of preflight planning, fill in the blanks in the worksheet with the specific data for the flight.The following weights were used to complete the sample weight and balance worksheet in Figure 5-3. Multiply each item’s weight by its arm to determine the moment. Then, determine the total weight and the sum of the moments. Divide the total moment by the total weight to determine the CG in inches from the datum. For this example, the total weight is 3,027 pounds and the CG is 43.54 inches aft of the datum (a negative result would have indicated a CG forward of the datum). 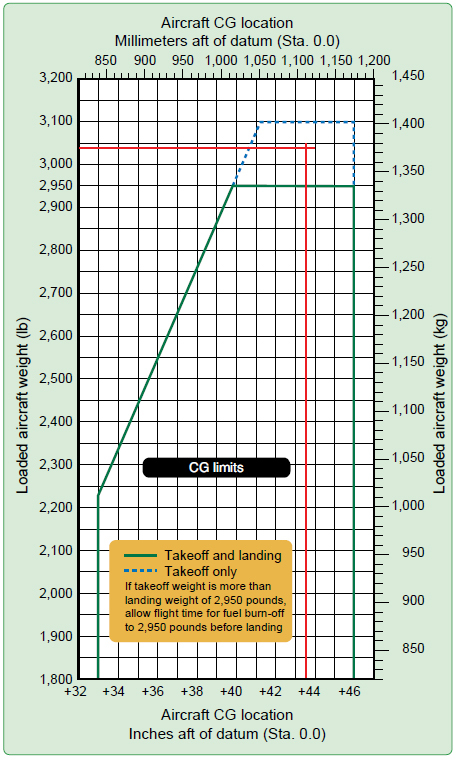 To determine whether or not the airplane is properly loaded for this flight,use the CG limits chart. [Figure 5-5] Draw a line vertically upward from the CG of 43.54 inches and one horizontally to the right from the loaded weight of 3,027 pounds. These lines cross inside the envelope, which shows the airplane is properly loaded for takeoff, but 77 pounds overweight for landing. 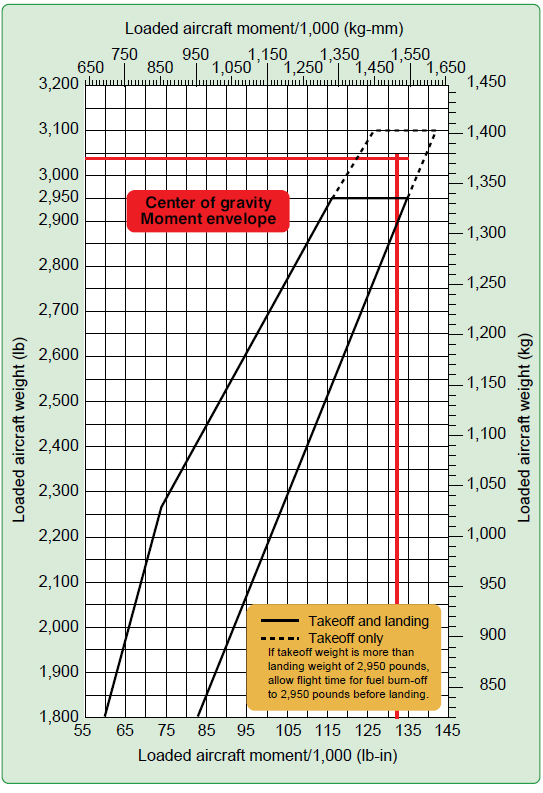 Note that for this sample chart, the envelope is defined by the solid black line that indicates CG limits at or below the maximum weight for takeoff and landing. There is an additional region identified by a segmented black line that includes weights suitable only for takeoff. It is important to note these subtle differences as they may or may not be found in every POH/AFM. Figure 5-5. CG limits chart from a typical POH. Moments determined by multiplying the weight of each component by its arm result in large numbers that are awkward to calculate and can become a source of mathematical error. To eliminate these large numbers, moment indexes are sometimes used. The moment is divided by a reduction factor, such as 100 or 1,000, to get the moment index. The loading graph provides the moment index for each component to avoid mathematical calculations. The CG envelope uses moment indexes rather than arms and moments. The CG limits envelope is the enclosed area on a graph of the airplane loaded weight and the CG location. If lines drawn from the weight and CG cross within this envelope, the airplane is properly loaded. Figure 5-6 is a typical loading graph taken from the POH of a modern four-place airplane. It is a graph of load weight and load moment indexes. Diagonal lines for each item relate the weight to the moment index without having to use mathematical calculations. To compute the weight and balance using the loading graph in Figure 5-6, make a loading schedule chart like the one in Figure 5-7. In Figure 5-6, follow the horizontal line for 300 pounds load weight to the right until it intersects the diagonal line for pilot and front passenger. From this point, drop a line vertically to the load moment index along the bottom to determine the load moment for the front seat occupants. This is 11.1 lb‑in divided by 1,000. Record it in the loading schedule chart. Determine the load moment for the 175 pounds of rear seat occupants along the diagonal for second row passengers or cargo. This is 12.9; record it in the loading schedule chart. Figure 5-7. Loading schedule chart. Determine the load moment for the fuel and the baggage in areas A and B in the same way and enter them all in the loading schedule chart. The maximum fuel is marked on the diagonal line for fuel in terms of gallons or liters. The maximum is 88 gallons of usable fuel. The total capacity is 92 gallons, but in our example, 4 gallons are unusable and have already been included in the empty weight of the aircraft. The weight of 88 gallons of fuel is 528 pounds and its moment index is 24.6. The 100 pounds of baggage in area A has a moment index of 9.7 and the 50 pounds in area B has an index of 5.8. Enter all of these weights and moment indexes in the loading schedule chart and add all of the weights and moment indexes to determine the totals. Transfer totals to the CG moment envelope in Figure 5-8. 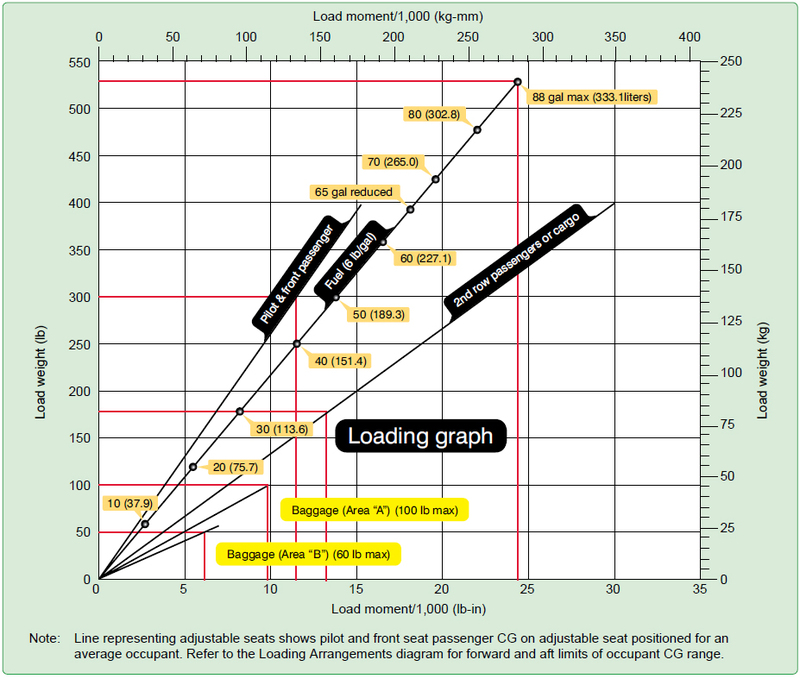 The CG moment envelope is an enclosed area on a graph of the airplane loaded weight and loaded moment. If lines drawn from the weight and loaded moment cross within this envelope, the airplane is properly loaded. 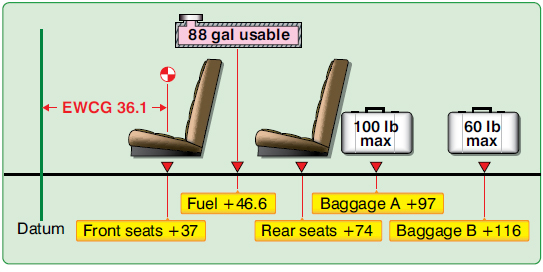 The loading schedule from the example in Figure 5-7 shows that the total weight of the loaded aircraft is 3,027 pounds, and the loaded airplane moment divided by 1,000 is 131.8. Figure 5-8. CG moment envelope. Referring to Figure 5-8, draw a line vertically upward from 131.8 on the horizontal index at the bottom of the chart and a horizontal line from 3,027 pounds in the left-vertical index. These lines intersect within the dashed area, which shows that the aircraft is loaded properly for takeoff, but it is too heavy for landing (similar to the previous example). Because of this, if the aircraft had to return for landing immediately after takeoff, it would need to fly long enough to burn 77 pounds (slightly less than 13 gallons) of fuel to reduce its weight for landing.